Transform any bedroom into an exotic garden oasis with the Laurel Springs pillow collection. The traditional leafy vine, floral and coordinating stripe design come to life in rich jewel tones of crimson red, green, blue, and gold with contrasting cream accents on a natural ground. Fluttering butterflies and busy dragonflies add flair and visual interest to the beautiful floral design. The bold patterns, bright accents and decorative motifs, offer an elegant and majestic update to any decor. 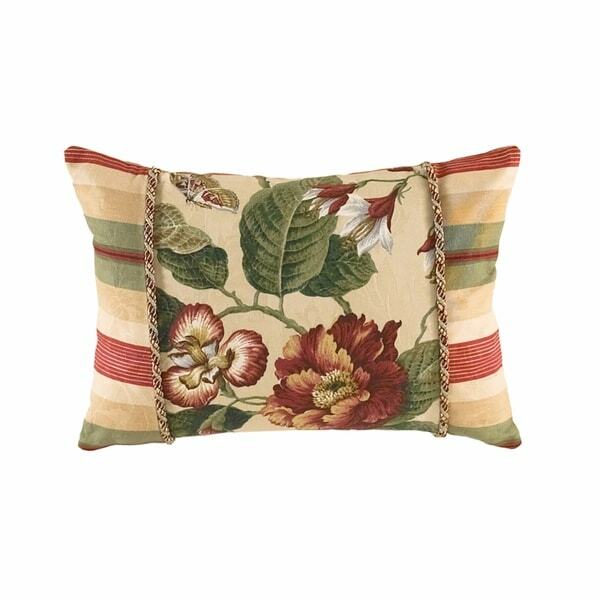 I bought this oblong accent throw pillow to go with the Waverly Laurel Springs comforter set I purchased from Overstock. It is a beautiful pillow - heavy and well made and I was delighted with my purchase. Bought this comfy pillow that coordinates with the lovely window panels. Makes our sunny family room so warm and inviting. Great quality; beautiful design! Items made in America are more sturdy but also come with a price increase. Do your research to see where this item is made, I have enjoyed so far but that doesn't always mean its going to last. I just enjoy purchasing from Overstock due to excellent customer service. Beautiful pillow. Unfortunately, I returned it because the background color is beige--I was hoping for a creamy white. Beautiful pillow, love the braid.